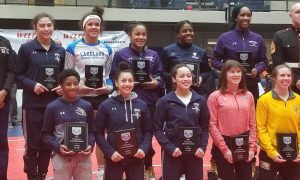 Parrish’s performance has helped Simon Fraser to finish second at the WCWA Championships in each of the last three seasons. Over the last year, Dom’s success has not been limited to the collegiate scene. She has also competed at the U23 World Championships in 2017 and 2018. In the 2018 event, Parrish took fifth-place, just a match shy of earning a medal. She also took second in the Schultz this January, without wrestling in her final bout due to her shoulder injury.